As a smart ISO burner tool, 4Media ISO Burner can burn ISO file into CD/DVD disc accurately without losing any data at the fastest speed. The ISO burner supports various input formats including BIN/CUE, IMG, MDF, NRG, CDI, B5i, B6i, DMG, etc. 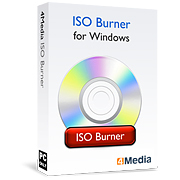 No matter the source is data CD/DVD image, bootable CD/DVD image, or media CD/DVD image, this ISO image burner tool can burn ISO image freely. With 4Media ISO Burner, burning ISO file is not a difficult thing. 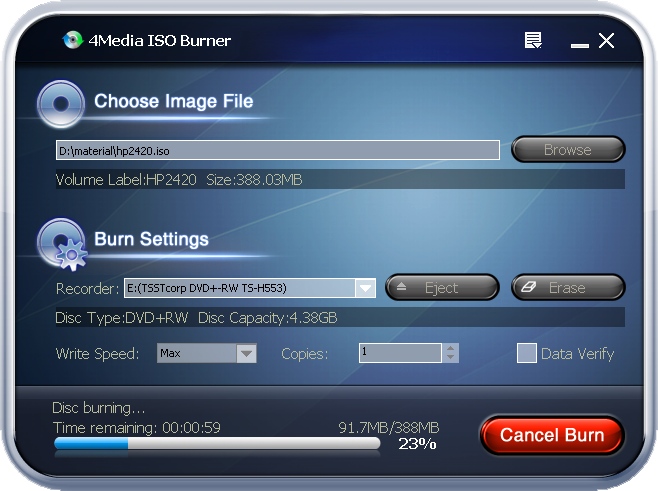 ISO Burner tool can help you burn ISO file into CD/DVD disc, also, other image files such as BIN/CUE, IMG, MDF, NRG, CDI, etc., can be burned effortlessly. Although the ISO Burner software is a very small tool, it supports many output formats, e.g. CD-R, CD-RW, DVD-R, DVD+R, DVD+R DL and DVD-RW, DVD+RW. After burning, the program will verify the written data so as to guarantee the veracity and usability of the content. Own and experience 4Media ISO Burner, high compatibility and fast ISO burning speed will bring you wonderful enjoyment. The burning process bar will show you the detailed information such as the rate of progress, the elapsed and left burning time, etc. The ISO burner offers you many interface languages such as English, Japanese, German, etc. Copyright © 2002-2008 4Media Software Studio. All rights reserved.